At iCare K-9 Pet Services, we know that choosing a dog boarding facility is a very important decision. We also have a boarding service starting at just $42/night, we offer some of the area’s most affordable accommodations for your pet. We also offer more spacious options for dog boarding–depending on your needs. Give us a call today at (301) 963-6962 to discuss all of our Gaithersburg Dog Boarding, Day Care, and Training Center options and prices! You can rest assured that when you leave your dog in our care that they’re in good hands. They’ll stay, play, and rest comfortably in our clean and secure facility. Our caring staff is well-trained in dog behavior and can ensure your pet’s playtime is structured to fit their individual needs. Doggie play sessions are closely monitored to ensure a peaceful and positive environment is maintained at all times. What really sets iCare K-9 Pet Services’ Boarding and Day Care in Gaithersburg apart from others is our structured approach. We have expert trainers on staff that spend time with each dog working on any issues the owner may be concerned about. We don’t simply turn loose a pack of dogs during playtime. We select your dog’s playmates very carefully. We base our decisions on a number of factors including, the size of the dog, energy level/drive, past history, age/physical condition, and overall temperament. iCare K-9 Pet Services offers a top-of-the-line dog boarding service for residents Montgomery County and the surrounding areas. 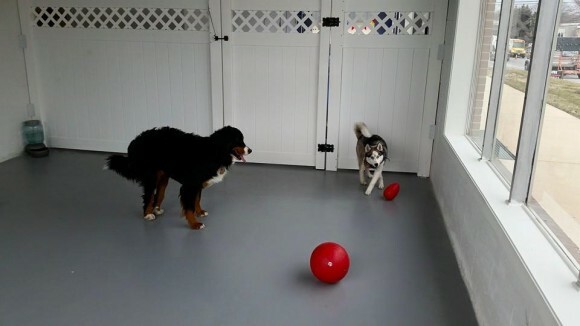 Our staff will provide the individualized attention needed to challenge your dog both mentally and physically. They’ll have a rich and full experience during their stay as our special guests! We also offer a Doggie Day Care for your convenience. Our boarding guests are treated to the same structured activities and fun-time as our Gaithersburg Dog Day School participants. ***We strongly recommend that when you board your dog whether if it’s at iCare K9 or another facility, that you leave your dog with extra food. Your dog’s activity levels will generally increase while boarding especially if you add on daycare during their stay. If your dog spends time alone at home sedentary while you’re at work and eats only 3 cups per day, then your dog may require 4 cups while boarding. Even extra barking by your dog can burn additional calories, so not providing enough food over 2 or 3 days may result in weight lost. So, to be on the safe side we suggest adding an additional 20% of extra food during a boarding visit. Visit us today at our facility conveniently located in Gaithersburg. We’re located not far from the intersection of Oakmont and Shady Grove Road–just a short distance from MD-355. Easily accessible from I-270/I-370, Germantown, Rockville, and just a quick hop away from the communities of Montgomery Village, Derwood, Washington Grove, Redland, King Farm and Falls Grove. We sanitize our Dog Boarding and Day Care Kennel spaces with Wysiwash! *Our dog boarding kennels are made from materials that will not rust, rot or absorb water. The material is easy to clean and naturally anti-microbial, providing a safe place for animals. The materials are waterproof, mold resistant, lead-free and silicone-free. The materials used are also 100% recyclable and built with at least 35% post-industrial recycled material. Check Out Policy: Check out for boarding is 12:00 pm noon. Picking up after 12:00 pm noon will incur an additional cost of $35.00 on top of your final boarding cost. Raised Bed/Cot/Blankets available by request. 24 Hour access to water. Meals, Toys and Treats as provided by owners. Multiple outdoor walks with expert dog handlers. Bath included with boarding stays of 3 days or more. Ask about our extra dog boarding options upon check in; training, extra walks, private playtime, group play with swim time or private swims.